Most people don’t associate forklifts with natural disasters. Yet, forklifts provide a very useful tool for helping to clean up after a hurricane, tornado, or other destructive weather events. To understand the key role they play in post-disaster relief efforts, it helps to look at just how much damage a natural disaster can cause. Destruction of that extent requires massive relief efforts. Much of those efforts involve getting food, medical aid and supplies to victims as quickly as possible. With their ability to safely move large amounts of goods – even in difficult terrain – forklifts are an essential part of any disaster recovery. They provide valuable service both before and after a disaster. After a major disaster, food and other supplies pour in from many areas. Some of it comes by truck, some by plane. In some areas it can also be shipped in by rail. No matter how supplies arrive, they need to be organized and distributed to the areas where they are most needed. Forklifts play a vital role in getting supplies where they need to go. First, they help load the relief supplies onto trucks and planes for shipment to the affected area. At the disaster site, they safely unload pallets of food, water and other supplies. Then they transport them to aid stations, distribution centers or other places that have been set up to provide relief. In addition to food and water, forklifts also help unload and distribute medical supplies, clothing, and other personal items. They are also used to safely unload heavy equipment. Pumps that can drain large amounts of flood water and generators that provide power are always in demand after a disaster. Rebuilding after a disaster can’t begin until the wreckage is cleared away. In many cases the amount of ruined homes, wrecked cars, downed power lines and other debris can be staggering. In addition to carrying away piles of debris, forklifts can also perform jobs you might not expect. For example, after Hurricane Harvey, a forklift was used to recover a car that was completely buried by sand on a beach in Port Arkansas. Roads, highways and bridges can also suffer extensive damage after a major disaster. Forklifts can help with clearing debris from these areas so supplies can get where they need to go without delay. Fortunately, some storms give advance warning of their arrival. Forklifts are often use to help with advance preparations to minimize damage. In coastal areas, marina owners will often use heavy-duty forklifts to pull boats out of the water and store them in safe locations. Businesses can also use forklifts to relocate equipment to safer areas before a storm arrives. For example, some companies store products and equipment outside to maximize storage space. Forklifts can bring these items inside or move them to higher ground if flooding is expected. Forklifts are also useful for carrying sandbags to help prevent flooding or redirect water to areas with better drainage. Safety training is essential for any type of forklift use. It becomes even more important when sending forklifts to assist with disaster recovery. Keeping your forklift operators’ training and certification up to date is quick and easy with ForkliftCertification.com. Disaster relief efforts often begin before a storm is over. If the worst of the wind and rain have passed, the Red Cross, FEMA, and other relief agencies begin moving in as soon as possible. This often includes the use of forklifts in rainy conditions. Today’s forklifts are designed to operate in a wide variety of work environments, including rain. The key is making sure the operators are properly trained on forklift safety in the rain. This kind of training – which includes OSHA certification – can be easily obtained online at ForkliftCertification.com. Before using a forklift in the rain, make sure it is designed to do so, especially if you have an electric forklift. Most of today’s electric forklifts are water-resistant and splash-safe. This means they can be used in light to moderate rain without risk to the forklift or the operator. The key word here is “most.” Not all electric forklifts are meant to be used in rainy conditions. In fact, some aren’t even designed to be used outdoors, even in nice weather. You can find out which type of forklift you have by checking its IP code. IP codes rate a forklift’s ability to withstand damage caused by liquid and solid objects. Every forklift should have a code that will tell you what it can and cannot do. These codes are also known as “Ingress Protection Markings”. They are located on the rating plate of forklifts, and should be easy to find. Your forklift’s IP code will help you determine whether it can be safely used in the rain. If your forklift is okay to use in rainy weather, there are a few other things to consider. First, electric forklifts usually have less power than gas or diesel-powered models. This can make it harder to navigate through mud or other rain-soaked terrains. The last thing you want is to get your lift stuck in a mud bog, unable to get out on its own. When operating a forklift in the rain, it won’t be as maneuverable as in a warehouse or other indoor work sites. The brakes may not respond as quickly. Visibility may be limited by the rain. The forks will be slick. Operators should be extra careful when driving and lifting. They should not hesitate to use their lights and horns when needed. Operators should wear quality rain gear, including treaded boots and gloves, to stay as dry as possible. This will help prevent them from getting distracted while handling the lift. At the first sign of lightning or thunder, shut down the lift and any other metal equipment to ensure everyone’s safety. Icy roads and slushy conditions can make braking harder than in the rain. Installing pneumatic tires or forklift tire chains can provide a better grip on the road. Operator comfort. Operators should dress properly to avoid numbness in the hands and feet that can affect braking and steering. Engine performance. Always warm up the engine for starting work to keep it and the hydraulics working smoothly. Worksite conditions. 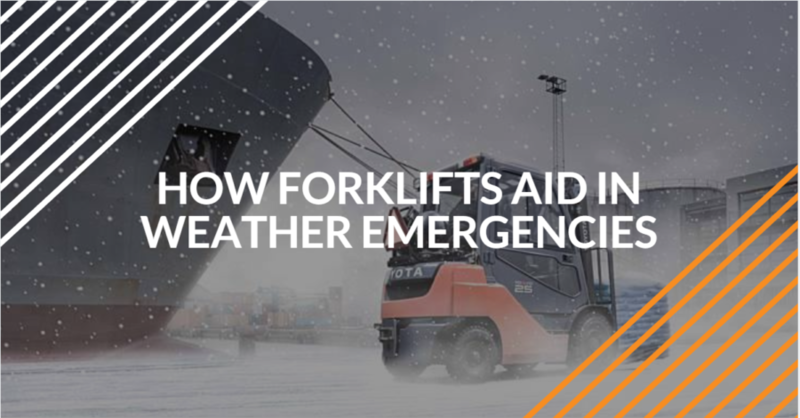 Strong winds and icy roads greatly increase the risk to the operator and the forklift. When roads are icy or slushy, never use a forklift on steep roads. Whether on the job or providing aid to a disaster relief task force, having well-trained operators is essential for everyone’s safety. ForkliftCertification.com provides OSHA-compliant training for all types of forklifts in all kinds of weather conditions. Our training is quick and affordable. It can be taken anywhere you have Internet access. And workers receive their certification as soon as they complete the training.